What is the spiciest dish you’ve ever eaten? I’ll bet you’re thinking only of fiery hot red chillies. Yet, other things than chillies can blast off the top of your head. Japanese wasabi paste comes to mind. Korean cuisine has a yellow mustard that’s ear-burning too. I was once invited to a Korean banquet where an innocuous salad of cold jellyfish was served with mustard that almost took off the roof of my head. My hosts, unfortunately, spoke no English, and I no Korean, so I was not able to find out anything about the hot devil, but the spice factor still lingers in my memory. Chillies are a whole new ball-game. Sichuan food makes use of both Sichuan peppers which is a type of aromatic peppercorn as well as chillies. And they’re not used in the mingy amounts that Indian cooking favours: they’re coarsely chopped and added by the fistful, so that if you have 200 grams of fish, you have 200 gms of chillies too. And this, my friend Sanjeev Goswami assures me, is what they eat day in and day out, every day of their lives. Goswami runs one of Delhi’s finest Chinese restaurants, The Chinese. One of their specialties is a dish called, somewhat facetiously, fish cooked in water. Don’t take the name literally. The water has been steeped in more chillies than an Indian kitchen would use in a month. Are you actually supposed to eat them? God knows. I certainly didn’t, but almost had to call the fire brigade anyway. WelcomHotel Sheraton, Saket, has a food festival on right now in Panasian, its oriental restaurant. Its inhouse chefs, one from Thailand and the other from Sichuan, have prepared a menu that features the hottest dishes from each cuisine. So which is the hotter of the two? Both struck me as exceptionally flavourful, if pungent, but I suppose the prize must go to sour and pepper soup (Sichuan), famously known in India as hot and sour soup. You couldn’t taste anything but pepper and chillies. In India, I have yet to come across a single recipe book that tells you what type of chilly to use. And no, 1 tsp chilli powder isgood enough. Guntur chillies are responsible for Andhra Pradesh’s cuisine being so incendiary, though a particular bird’s eye chilli in Assam has recently been awarded the distinction of “hottest in the world”. A friend, the author of a cookbook on Rajasthani food, assures me that lal maans cooked in a Rajput home in Rajasthan, would be inedible by anyone else, such is the level of spice in it. 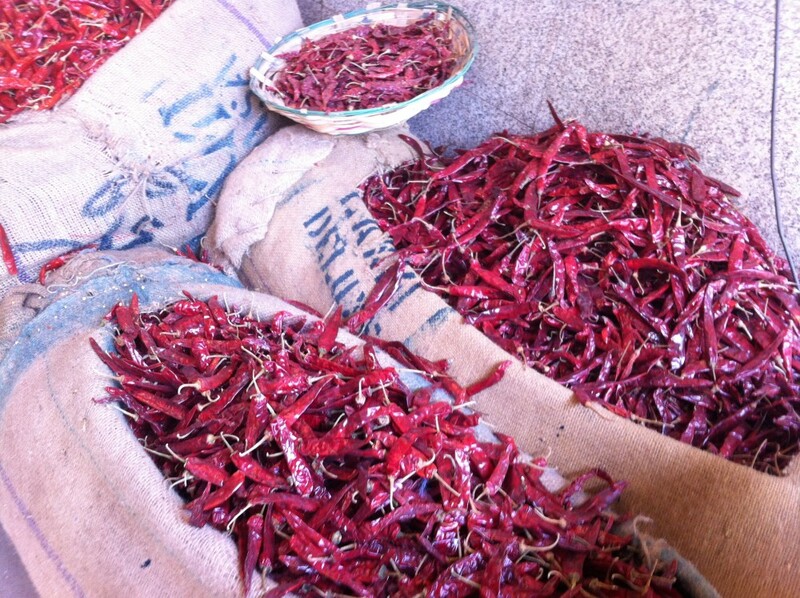 It probably uses Rajasthani chillies – think picture postcards of miles of chillies being dried around Kishangarh. Goan chillies differ from village to village, those in Moira being considered the worst offenders, while Kashmiri chillies are considered more flavourful and rich in colour than actually pungent. And while we’re on the subject of spice, would somebody please put together an authentic Mexican food festival? A country that boasts of 200 varieties of chillies must have a few dishes that could give spicy Indian cuisine a run for its money. Caption: The spiciest dish I’ve heard of is a chutney from Nagaland called Mirchi Raja. Made of the world’s hottest chilli, it’s eaten as a seasoning in curries and bamboo shoot too. Not recommended for the faint of heart.